Snyk joins the Continuous Delivery Foundation as a founding member. Do you really know how a lockfile works for yarn and npm packages? 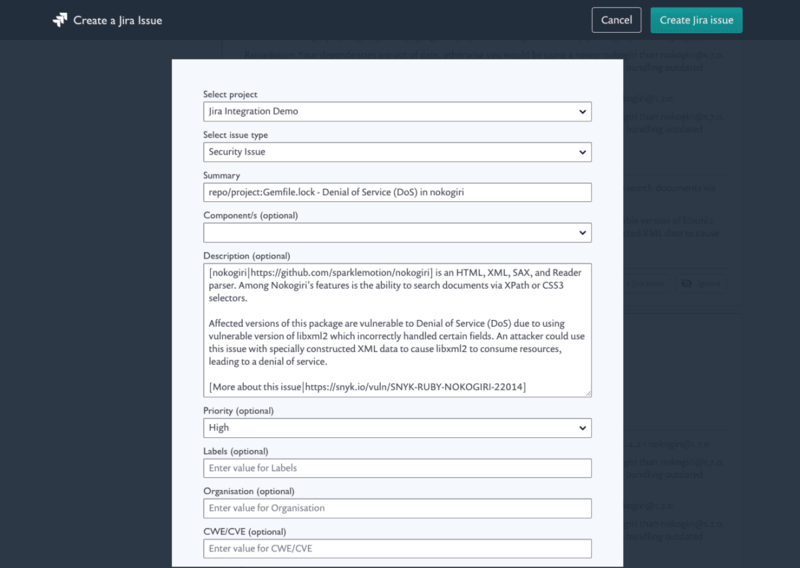 Our Jira integration allows you to raise issues for vulnerabilities or license issues in Snyk. It’s available to all our Pro and Enterprise customers. Our integration includes an API (see our API docs), and a way to manually raise a Jira issue in the UI (documented here). If your Jira instance is private, you’ll need to get set up with Snyk’s Broker, and then follow our brokered Jira setup instructions. To connect your Snyk account to your Jira account, go to the integrations page in your organisation settings and type in your credentials. We recommend setting up a new user in Jira for this, rather than using existing credentials. You can authenticate by username and password, but we recommend authenticating by API token which you can generate from Atlassian API tokens. Once you’ve set up the connection, visit one of your Snyk projects. You’ll now see a new button at the bottom of each vulnerability and license issue card that allows you to create a Jira issue. When you click on this, a Jira issue creation form will appear with the Snyk issue details copied across into the relevant fields. You can review and edit this before creating the issue. Select which Jira project you’d like to send the issue to. The fields that we display below are based on the fields that project has, so switching between projects may show different options. Once you’ve created a Jira issue, the Jira key with a link will display on the issue card. If you’re using the Jira API, you can generate multiple Jira issues for the same issue in Snyk. You can also see which Jira issues have been created from the Issues view in your reports. We’re currently working on the second phase of our Jira integration which will give you the ability to set up automatic issue creation when a new vulnerability or license issue is found, as well as the ability to open tickets from Snyk in other issue trackers.